The underpinnings . . . These classes, within easy access from Edinburgh, Glasgow and beyond, are provided by Rose Whittington. Rose has done upholstery for more than 30 years. She has provided upholstery classes via East Lothian Council Adult Education Programme as well as teaching upholstery for many years at Jewel and Esk. 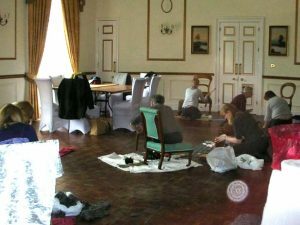 Her classes include all the basics from frame up to final fabric, and all sorts of furniture from footstools to settees. Vouchers for upholstery workshops within easy reach of Edinburgh and the Lothians are available. Check the calendar of upcoming dates.